Baby showers are such a special time to celebrate the expecting mom and to shower her with gifts. You are probably here because you have the great honor to host a shower for someone. I’m sure you want to make it memorable, a beautiful party to be cherished. You’ll find here 10 brilliant ideas for baby shower themes that are gender neutral but can of course be used even if you already know whether the mom is having a boy or a girl. I think you’ll find these baby shower themes for boys interesting too. Many of them work as a gender neutral theme. Check out also these awesome Baby Shower Themes for Boys and Girls. A cute, sweet theme! Little Treasure Baby Shower. Babies are special treasures and this theme celebrates that! Use a cute Little Treasure Sign like this one from Lil Humming Girl to decorate your dessert table or to welcome the guests to the shower. 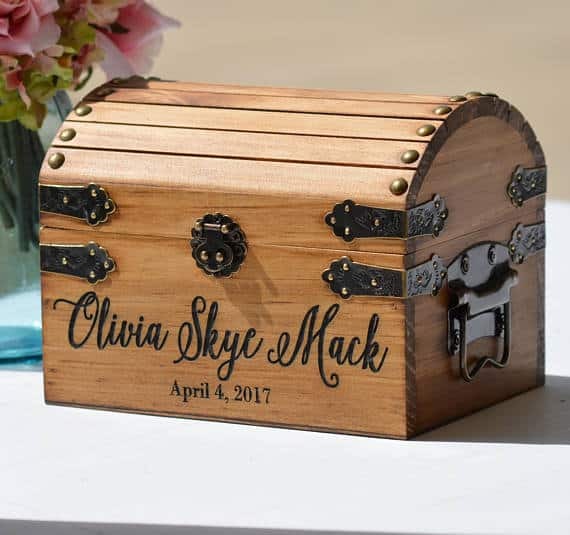 Fill treasure chests like these from Red Heart Creations with baby items and use the chests as centerpieces. Throw in some chocolate coins too. The mom-to-be will be delighted to receive all the fun items in the treasure boxes. 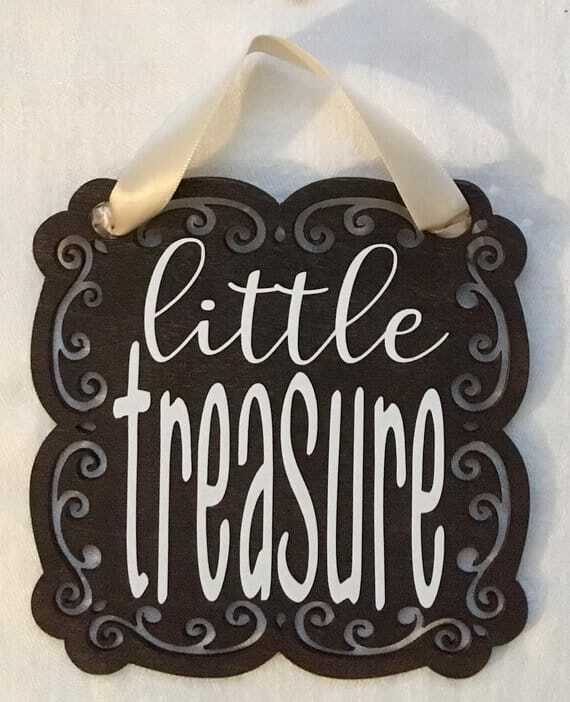 Make a Little Treasures Banner and hang it in front of the gift table. Baby snuggles. Loved those days snuggling with a baby. And I’m sure that is one of the things moms to be look forward to. Snuggles and Hugs baby shower can have cute blankies, pillows, and stuffed animals all over the place! You can easily create lovely centerpieces with folded blankets. Tie with a ribbon. Place a teddy bear on top. This cute baby doll comes with a sleep sack. You can choose from 4 different styles. It has those fun little tags on the side. Babies love labels. Mommy’s little Snuggle bug from Prints of Pop. This is a digital download. A cute decoration and a gift. 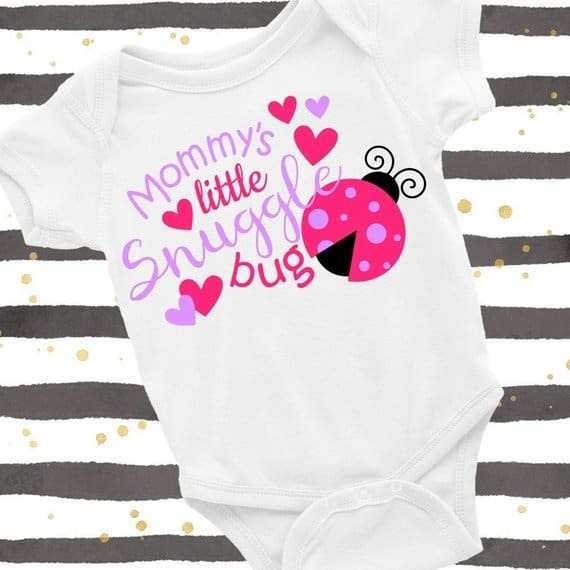 Create a onesies banner to hang up on the wall. 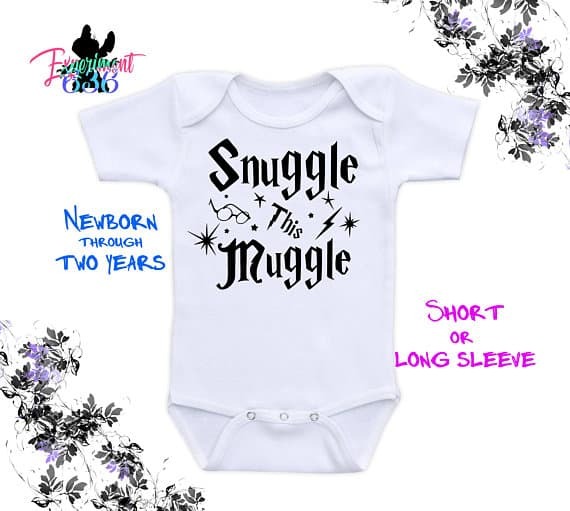 And for the Harry Potter fans: Snuggle This Muggle onesies from Experiment 636. Which gives you another baby shower theme: Harry Potter Baby Shower! 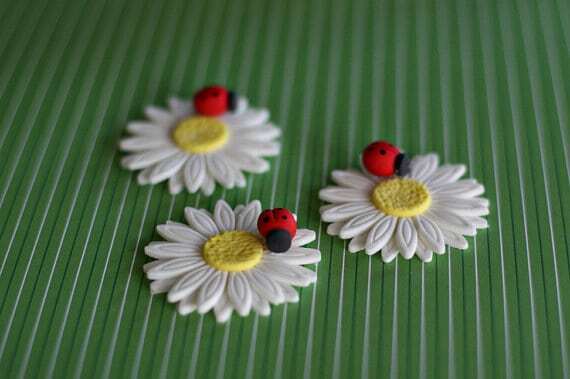 Beautiful Daisy and Ladybug cupcake toppers from Parkers Flour Patch will make the cupcake decorating a breeze! Serve also Hershey’s Hugs for the chocolate lovers. 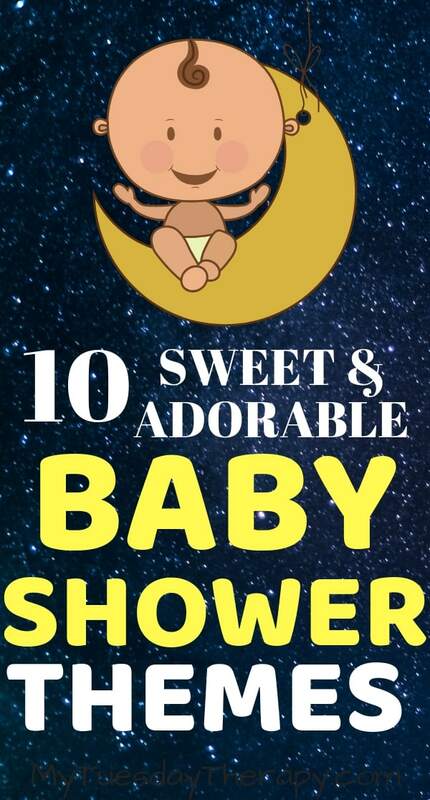 RELATED POST: What would a shower be without some EASY BABY SHOWER GAMES your guests will enjoy playing. This is such a fun, colorful baby shower idea! Every time I read the words “under the sea” I can’t help but humming to the tune from Ariel movie. I love how vibrant this DIY Coral Reef from Press Print Party is! 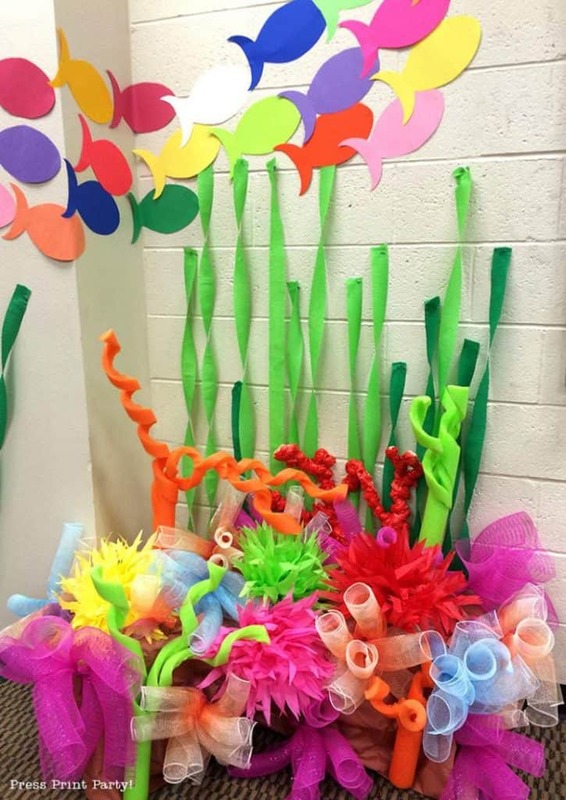 You’ll find detailed instructions on how to make your own coral reef. While checking out the coral reef instructions you may also want to take a peek at the beautiful Table Top Coral Reef. It is stunning! Create a fabulous atmosphere with these balloon bubble strands from Party Surprises! Looks like this one would be pretty simple to create yourself too. Lots of clear balloons in various sizes (5″ 12″, 18″ attached to transparent nylon thread hanging from the ceiling. Look no further Simply Creative Ways has you covered. They provide a whole menu of fun salty and sweet treats for your baby shower! 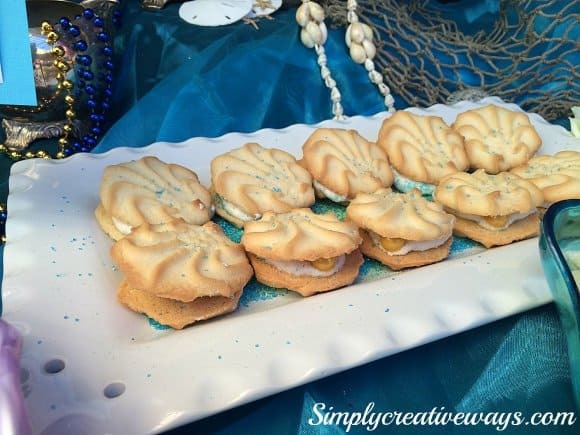 Clam cookies, crab sandwiches, “fish food”… Got to love that shiny tablecloth and sand dollars, shells, beads and the beautiful serving dishes used for the party. Cute As Can Bee! That’s what this party is! 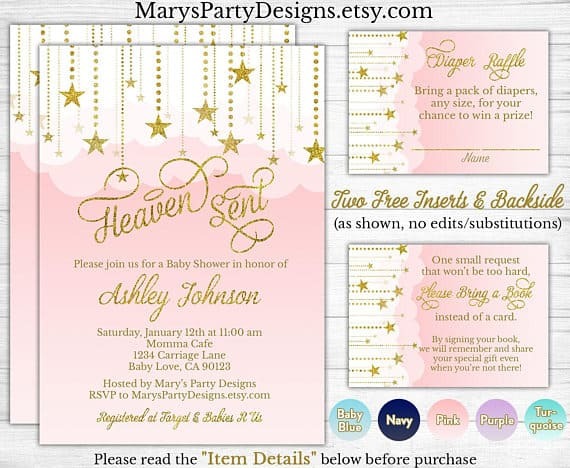 You’ll find some pretty cool ideas at Half Pint Party Design for a Mom to Bee Baby Shower! 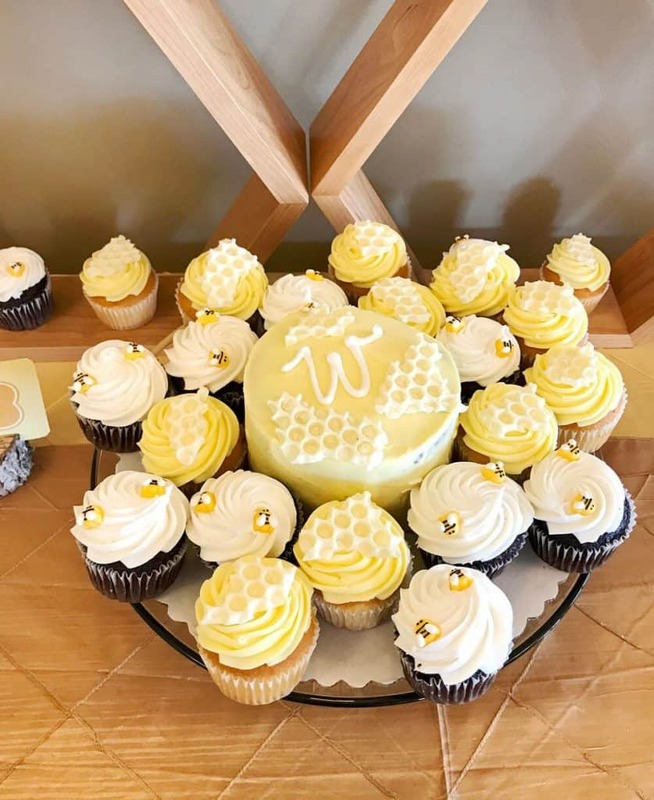 Those wooden honeycombs are the perfect backdrop for the dessert table! The idea to use wooden stumps as food card holders is very clever and goes well with the theme. The table setting is simple yet beautiful. Even if you don’t have a photo booth these props come handy for creating fun centerpieces. A simple activity for a Sweet as Can Bee Baby Shower is “how many in a jar”. Fill a glass jar with Honeycomb cereal and ask the guests to make a guess on how many of those are in the jar. Tissue paper fans are such an easy way to decorate a wall behind the dessert or gift table. And these black and yellow ones are made for a bee baby shower! Party favors… love them… don’t love them… It can be hard to come up with something to go with the theme that would also be something useful. These mini honey dippers would make cute party favors for Bumble Bee Baby Shower! Attach to a tiny honey jar or just tie a pretty ribbon around it and you are all set! Good food, music, laughter… Italy! A fun-filled baby shower you can center around Italian Dinner. So many food options to choose from! In addition to serving lasagna, pizza, or spaghetti and meatballs you could have an Italian Soda Bar! The guests could make a yummy soda with a flavor of their choice to enjoy with the meal or when waiting for everyone else to show up. And one of the activities at the baby shower could be “make your own pizza”! 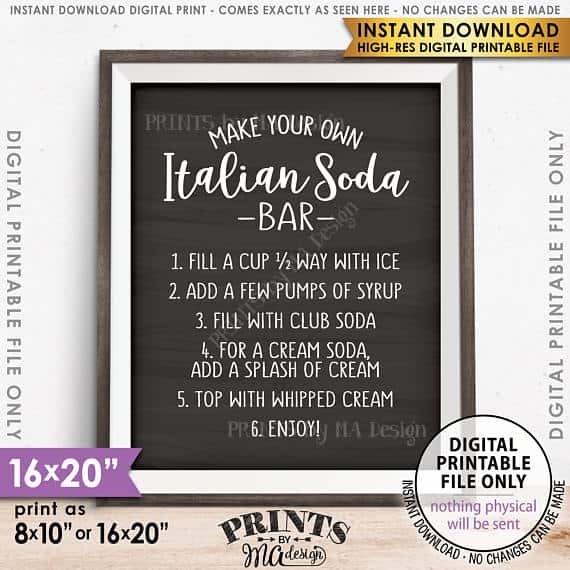 If you would prefer to not have to print one but get a wooden Italian Soda Bar Sign. Bambino can refer to either one if you do not know which one is on the way. 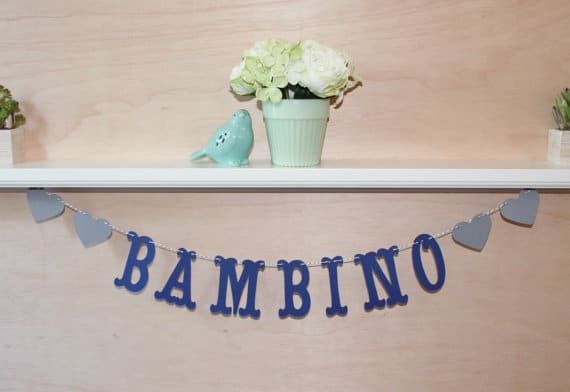 This cute Bambino banner from Jess Made This has over 40 color options! You are sure to find one that goes with your theme! 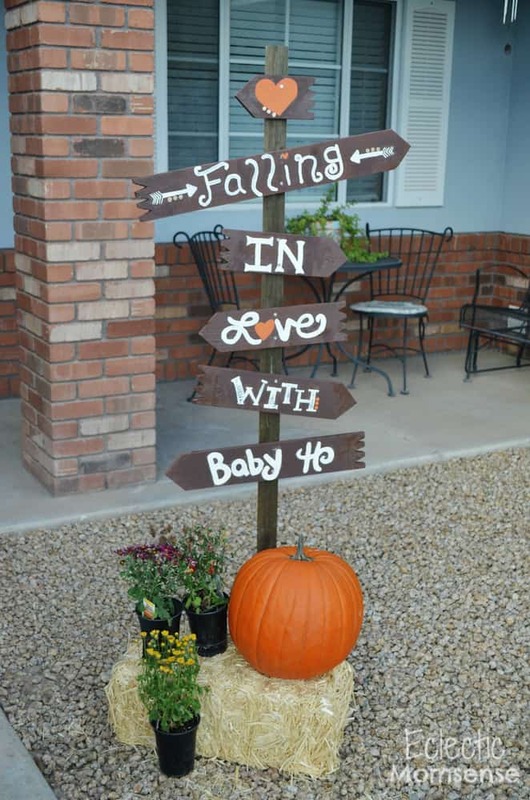 Though pumpkins remind us of the autumn you can host a Little Pumpkin Baby Shower anytime of the year! Just look at this elegant Gold Polka Dot Pumpkin idea from The Kitchen McCabe! Painting your pumpkins will definitely change the autumn feeling to spring (or any other season)! 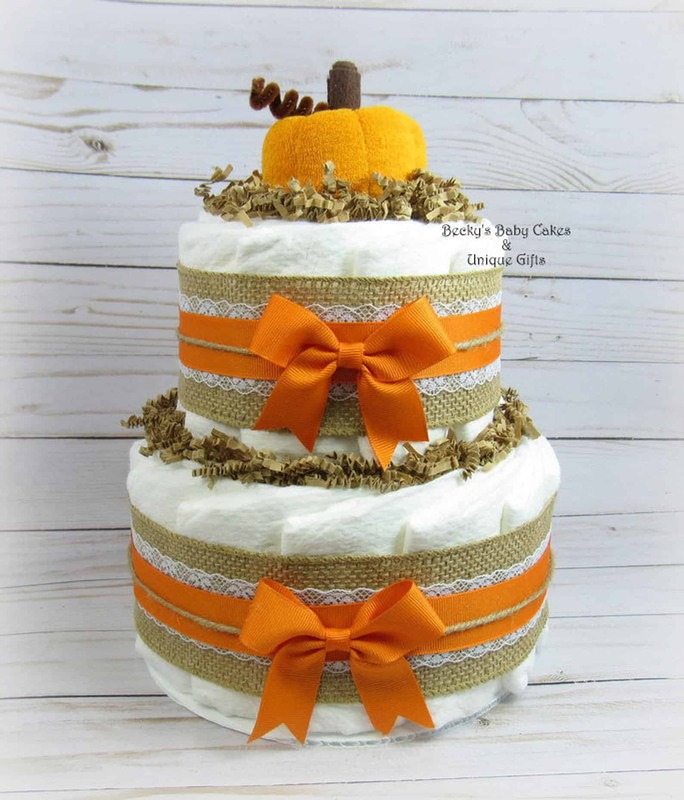 A simple and cute pumpkin diaper cake from Becky’s Baby Cakes and Unique Gifts is a great addition to any fall themed baby shower. Learn to make a diaper cake with these easy how to make a diaper cake instructions. RELATED POST: AWESOME DIAPER CAKE IDEAS FOR BOYS AND GIRLS. 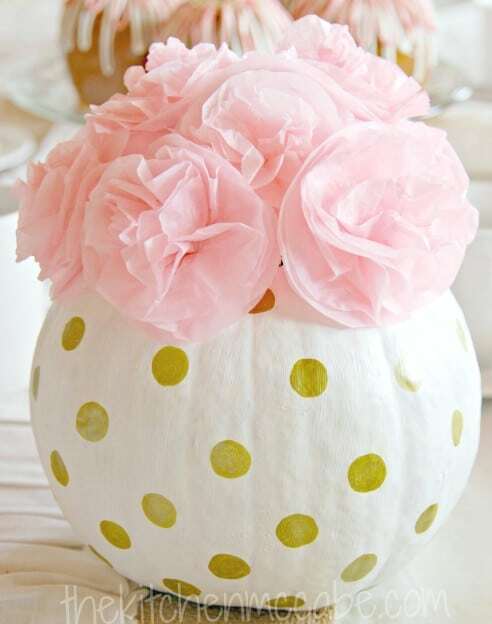 Lots of beautiful ideas for a Little Pumpkin Baby Shower at Eclectic Mom Sense. Cute signs, banner and a lovely table setting you don’t want to miss! All you need is pretty pastels and you have your color scheme set for the most adorable ice cream theme baby shower! Everyone… almost everyone loves ice cream and you can serve it in so many different ways. Check out these ice cream bar ideas. 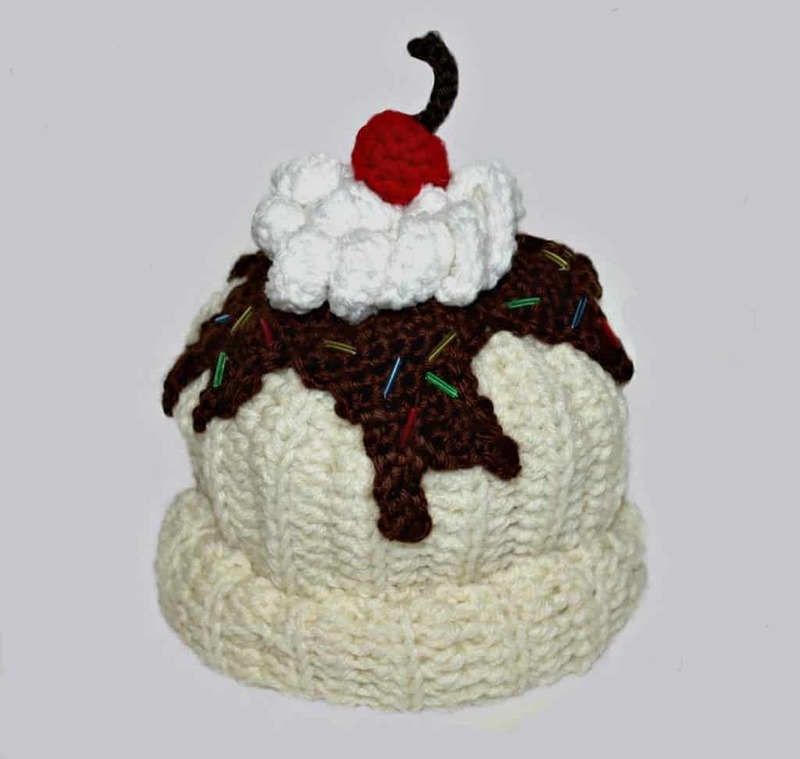 Use the cute ice cream sundae hat from Annieks Creations to top a DIY diaper cake or place it on a decorative box filled with baby gifts. This will be the best baby shower ever! CUTE!! What else can you say! 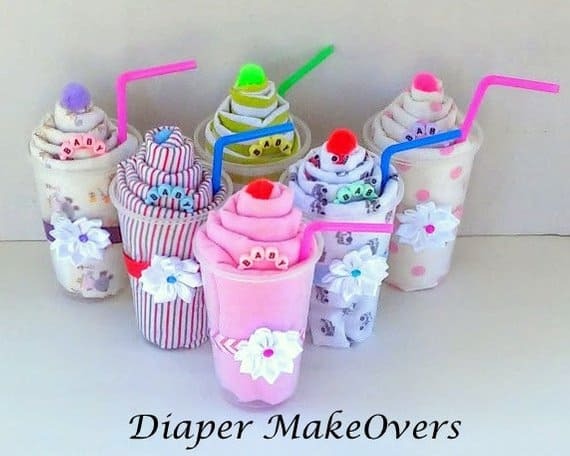 Use these cute Receiving Blanket Milkshakes from Diaper Makeovers to decorate the tables. They would also look fun at the dessert table! 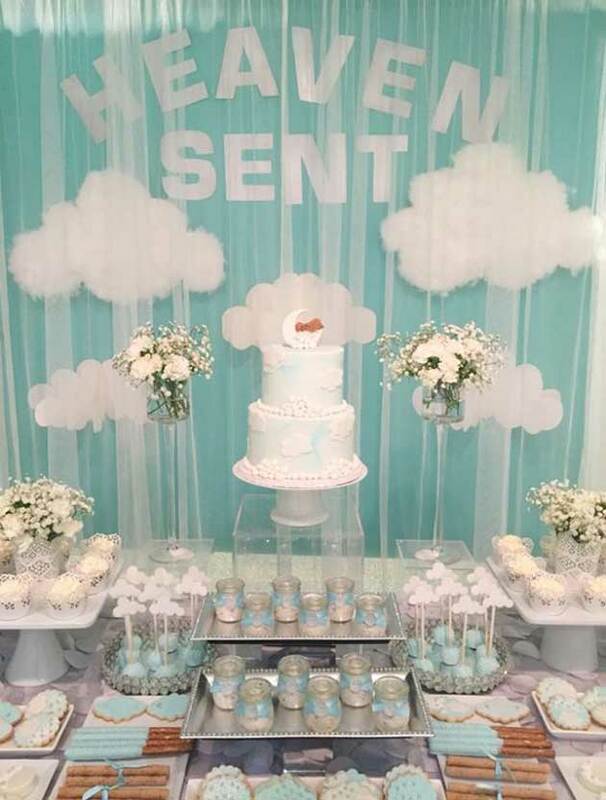 A lovely ice cream baby shower centerpiece was created by Fantabulosity. 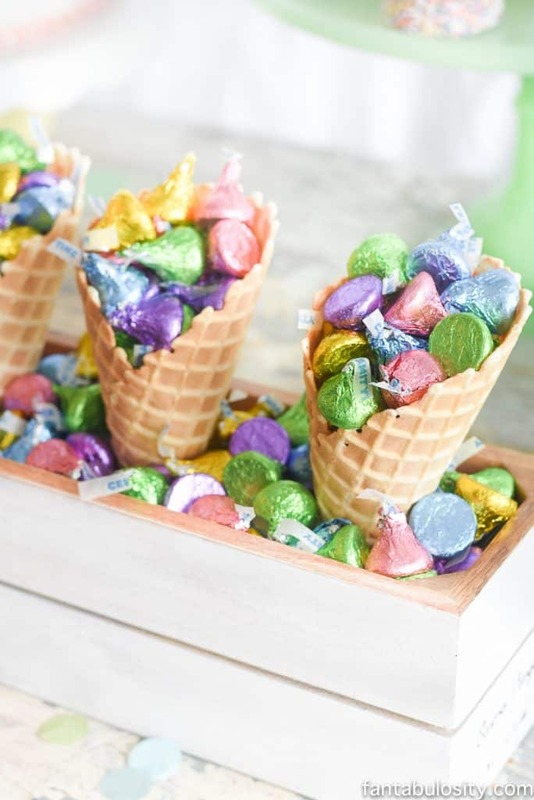 Ice cream cones filled with colorful Hershey’s kisses can be served at the dessert table or used as a gorgeous centerpiece. Tassels and pom poms in various colors are the perfect decorations for an ice cream baby shower. After looking at all these wonderful images I realized that I need to pick up my game in hosting an annual ice cream social :). All these ideas are so cute! And that is what a precious baby is – little sunshine! These lovely ideas are from We Heart Parties. 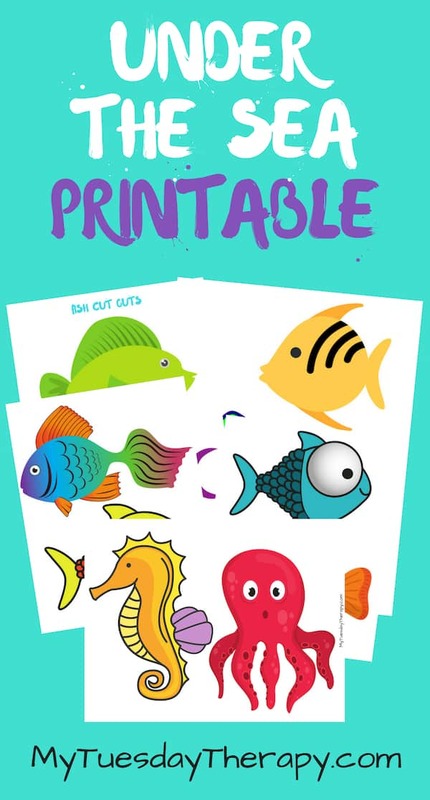 They also have a sweet free party printable for you to use. This theme is so cute and bright with the sunny yellow. 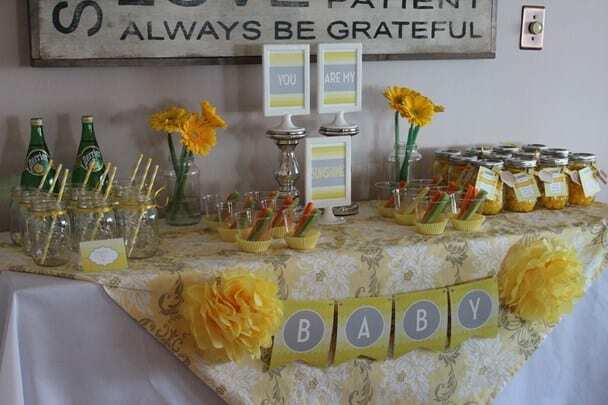 Gray and yellow are awesome colors for a gender neutral baby shower! 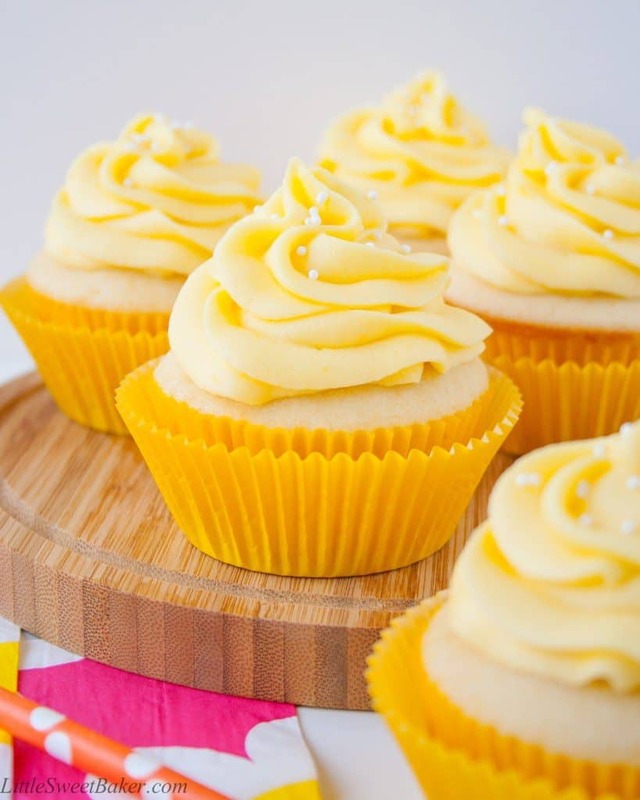 Mango Vanilla Cupcakes from Little Sweet Baker might convince you to pick Little Sunshine Theme! Yummy mango frosting on vanilla cupcakes. “…rich, buttery, moist…” The recipe has also an option to make them with a hint of coconut flavor. Thesecute balloons are sure to bring a smile on everyone’s face! Babies truly are heaven sent! This beautiful gender neutral baby shower can easily be made into a boy or girl baby shower. Lots of lovely images at Mon Delice. With this party you can have many color combinations. White and gold, white and silver, white and yellow, gold and pink etc. 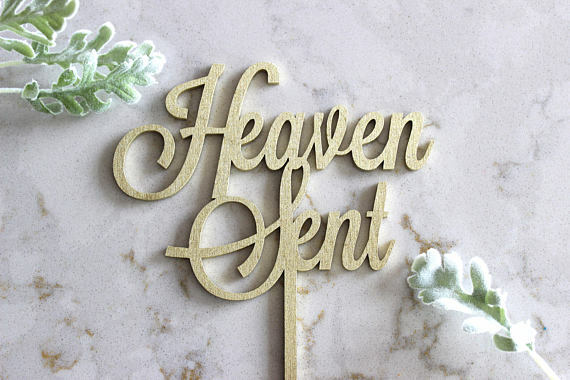 Beautiful cake toppers like this Heaven Sent add a special touch to the memorable occasion. This cake topper is made out of birch wood. You can choose from several color options! If you are looking for gorgeous invitations to send, these are for you! They also include the popular “bring a book instead of card” insert. And also the clever idea for Diaper Raffle. And with the variety of colors you can use these for a boy, girl or a gender neutral baby shower! If you would rather have something already printed and sent to you in a mail then you might be interested in these Heaven Sent Invitations. Lovely option with various color choices! Having a baby starts a new adventure in life! Celebrate the new beginning with the wonderful Adventure Awaits Baby Shower. Decorate with hot air balloons and lovely flower arrangements. Vintage suitcases make perfect party props. You’ll find many fun ideas for invitations, decorations, prizes etc. 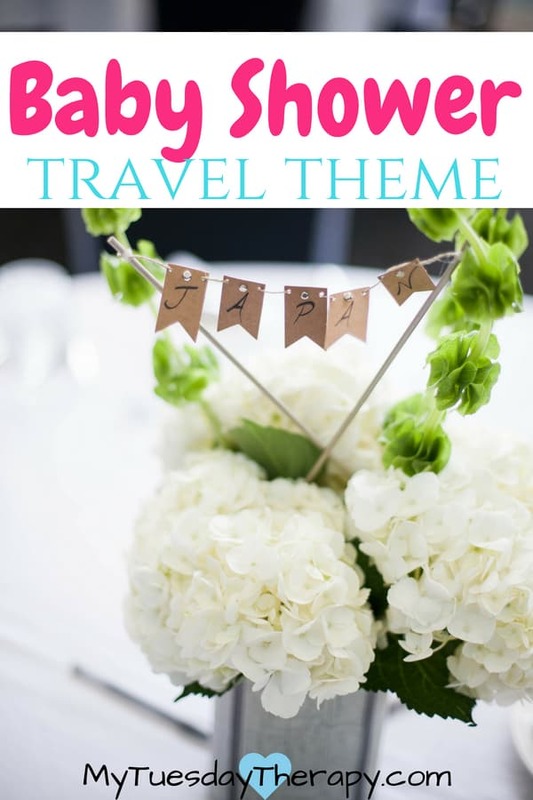 in this Travel Themed Baby Shower post which I had the privilege to attend and to write about. There are many precious gender neutral themes to choose from. I hope you found one that you really like among these. For more gender neutral ideas check out Themes for Boys and Girls and inspiring Diaper Cake Ideas. Games and activities add a special touch to a shower and these Baby Shower Games are Easy and Entertaining. 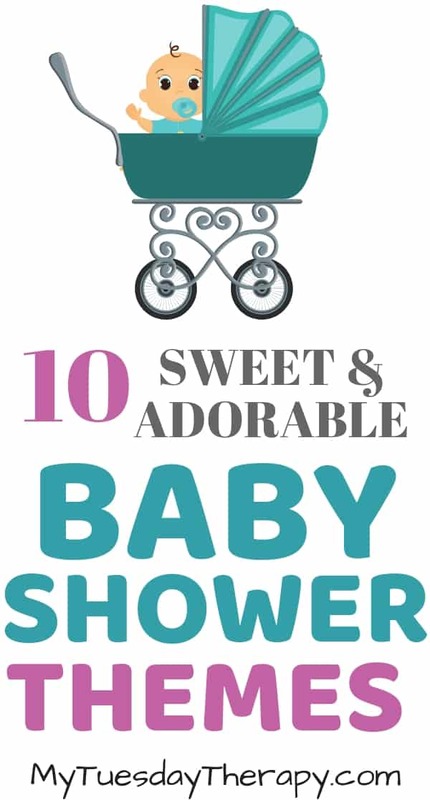 You might also want to check out these Baby Shower Ideas on a Budget. Planning parties is a lot of fun and I’m sure you will have a great time preparing and hosting an awesome baby shower for one lucky Mom to Be.